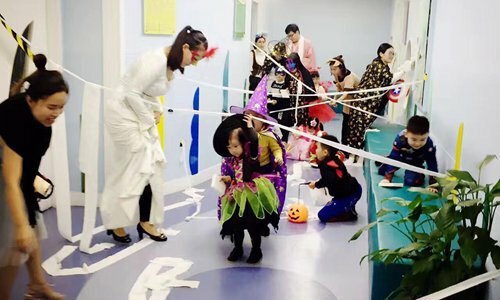 Kindergartens' zeal for Halloween celebrations has refreshed the debate over the influence of Western culture and the decline in popularity of Chinese traditional festivals. One lawmaker has called on the government to promote traditional holidays so as to boost their profile. The season that scares many young Chinese parents has come again. Homework assigned by their children's kindergartens will test their creativity and dedication to parenthood. Xu Lei, a parent in Beijing, received a notice from his son's teachers last week to prepare candies and a costume for his 3-year-old to celebrate Halloween. The dazzling array of Halloween products available in the doorway of a nearby supermarket quickly dispelled his fears. He finally bought a pirate mask, a bloody "knife" and a plastic laughing pumpkin, and brought them to the kindergarten last Friday morning. However, the other fathers apparently outdid him. Their kids had jack-o'-lanterns, wizard's cloaks, Spiderman suits and even military uniforms. "When I saw my kid was jealous of his classmates and their costumes, I felt a bit sorry," Xu said. In China, celebrating Western festivals like Halloween and Christmas has become a tradition in many kindergartens. Xu is skeptical about such traditions. "We adults do not even know the exact origin of Halloween, how could the kids know? Is such a celebration meaningful?" Some parents complain about the waste involved in Halloween as the props and costumes are only used once. Some others complain that teachers value Western festivals but neglect Chinese ones. "I don't disagree with teaching children about Western festivals and culture. Halloween is a kind of 'ghost day' in my understanding. But when Zhongyuan Festival (a day on which people worship their ancestors, also known as the Ghost Festival) comes, will the teachers teach children to burn 'ghost money'?" a parent from Chengdu, Sichuan Province, recently commented online. However, in some people's eyes, the kindergartens' zeal for Western festivals sheds light on some worrying trends. "It's just one small aspect of the phenomenon of Chinese worshipping foreign things. Lots of people travel, study and emigrate abroad," lamented He Youlin, deputy to the National People's Congress and former principal of Sun Yat-sen Memorial Middle School in Zhongshan, Guangdong Province. "The sense of national identity has declined." He has been proposing the government promote traditional Chinese festivals, such as requiring schools to get students to pay tribute to revolutionary martyrs on Tomb-Sweeping Day and extending the Spring Festival holidays. "They are important ways to foster patriotism but we have ignored it," He told the Global Times. Zhou Fengli, had similar worries 10 years ago. In December 2006, the then PhD candidate at Peking University signed an joint open letter with nine other academics from well-known universities, asking Chinese not to celebrate Christmas and warning against the "penetration and expansion" of Western culture. But his worries have been eased now. "The conditions have changed. The new generation of leadership has attached unprecedented importance to Chinese culture. The confidence in our own excellent traditional culture is in recovery," Zhou told the Global Times. But it seems most parents are not worried about such celebrations. The five parents interviewed by the Global Times all showed support for Halloween. "We should be open-mined. Celebrating Western festivals doesn't mean a denial of our own culture," mother of a 3-year-old in Beijing told the Global Times. "Besides, I don't think it's wrong that we admire US-led Western civilization, which has its charms. Otherwise, why don't we celebrate African or Indian festivals?" A mother of a 6-year-old surnamed Wang from Guiyang, Southwest China's Guizhou Province believes Halloween is a good chance for the kids to showcase their personalities. "My daughter chose to dress up as Elsa from Frozen last year. This year, she plans to be a wizard," Wang told the Global Times. "Thanks to the almighty Taobao, you can buy whatever props or dresses you want. They cost me no more than 100 yuan ($15) each time." A mother from Zhuhai, Guangdong Province said she supports the kindergarten to celebrate any kinds of festival as long as the kids are happy. "Playing and having fun is the most important thing at their age, right?" Shi, deputy head of a private kindergarten in Beijing, said the private ones usually celebrate Western festivals as they have English teachers from the West. This year, the celebration will begin at 2 pm on Halloween at her kindergarten. "We will help the kids dress up and apply makeup. There will be a group dance before class activities, including playing 'trick-or-treat' with neighboring classes," Shi told the Global Times. "It's an opportunity for kids to exercise their expressiveness and feel festive joy." On Christmas, the school will hold the biggest party of the year in which each class will give a performance, she said. While the parents are arguing, the businessmen are happy. Pumpkins sell out fast these days. Online sellers of props and costumes for Halloween and Christmas are also busy. On taobao.com, a search for "Halloween's costumes for children" has 18,000 results of shops alone. Supermarkets, amusement parks and even museums don't want to miss the chance either to attract customers. Weeks ahead of time, they started to decorate and organize activities. On October 17, a dozen young people dressed up as vampires and zombies boarded a subway in Chengdu. 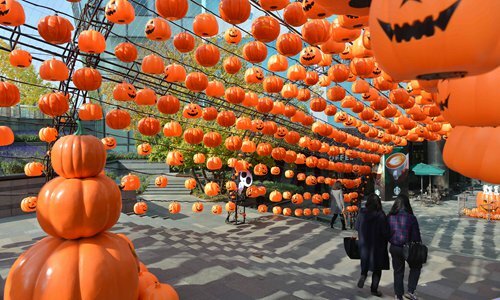 It was a publicity stunt held by the Chengdu Happy Valley amusement park to promote its month-long Halloween carnival. However, the stunt led to an outcry. On its Weibo, the Chengdu Metro authority said "Such kind of behavior on the subway is against social morality. It not only shocks passengers, but also harms the city's civilization. To such acts, Chengdu Metro firmly says 'No'." In addition, they posted one of the pictures of the costumed riders and wrote "say no!" over it. The "rejection" received many supporters, as well as many opponents. "They are creepy and contradict Chinese culture that shuns ghosts and devils," commented a Weibo user. "The culture is diverse and people get more inclusive. Isn't it better that the young people bring in some more interesting cultures?" said another Weibo user. There have been voices calling for the boycott of these festivals. In 2014, the education authorities in Wenzhou, Zhejiang Province banned all schools in the city from holding any Christmas-related events. Separately, Northwest University in Xi'an, Shaanxi Province, required its students to watch Confucius-themed documentaries on Christmas Eve. Nevertheless, He Youlin doesn't think such divisive words are wise. "Our festivals weigh much on customs and dining. But when livelihoods have greatly improved, people pursue spiritual needs. Western festivals can be amusing and creative, which meets young people's needs," He said. Besides, Chinese festivals are usually all on the Chinese lunar calendar, which is harder to keep track of, which also contributes to their popularity decline, he noted. The trend of traditional Chinese festivals losing popularity won't reverse unless we make changes, he suggested. "In my memory, the public organs, factories, companies or communities would all decorate their gates before when the festivals like Middle-Autumn Day, the National Day came. But now, many of them are silent," He said, adding that the festivals have simply become holidays for traveling. He advises the government to readjust and prolong the holidays for the major festivals holidays, and require various work units to create a festive atmosphere by flying national flags and holding military parades every five years. Ideology and patriotism have become heated topics in recent years. In January 2015, China's former Education Minister Yuan Guiren said that Chinese universities should maintain "political integrity" and never "let textbooks promoting Western values appear in our classes." President Xi Jinping has warned several times about the ideological penetration of Western forces. In a speech made in 2013, Xi described ideological work as "extremely important." In a speech made at a national Party school work conference in December last year, Xi criticized some Party members as advocates of "Western capitalist ideology," and noted that there are hostile forces who attempt to subvert the Party's rule and faith in Marxism, socialism and communism. Zhou Fengli believed that the popularity of Western festivals is mainly created by commercial activities. "They are losing their original religious and cultural connotations," he said. Zhou also thinks it is a symbol of the diversity and inclusiveness of the young generations. "Just like 'double 11' day, which had been celebrated as Singles Day, but has now become a shopping carnival. You can choose not to celebrate, but there's no need to oppose it," said Zhou, who is a public servant now. Public kindergartens usually don't celebrate these Western festivals, said Shi, who has engaged in preschool education for 13 years. A parent surnamed Li of a 11-year-old boy in Beijing said the schools don't celebrate Western festivals, either. "My kid's school has recently organized a series of activities to commemorate the 80th anniversary of the victory of the Long March, such as recitation contests and artistic performances," he said.